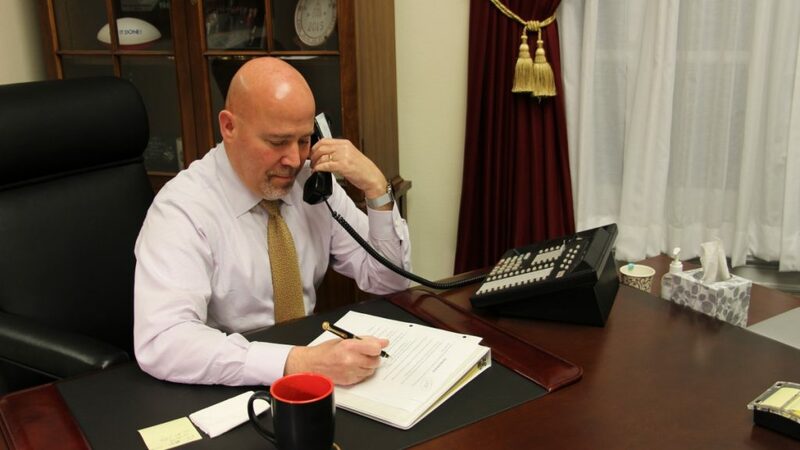 Two-term New Jersey Republican Congressman Tom MacArthur represents a district that stretches from the Philadelphia suburbs to the Jersey shore and includes the Town of Toms River, home to a fast-growing Orthodox community. Now, he is in the last leg of a neck-and-neck race with Democratic challenger, Andy Kim, a former Obama administration advisor on national security issues. The race has been closely watched, not only in southern Jersey, but nationally, as it is one of many highly competitive races that will play a role in who will lead the 116th Congress. 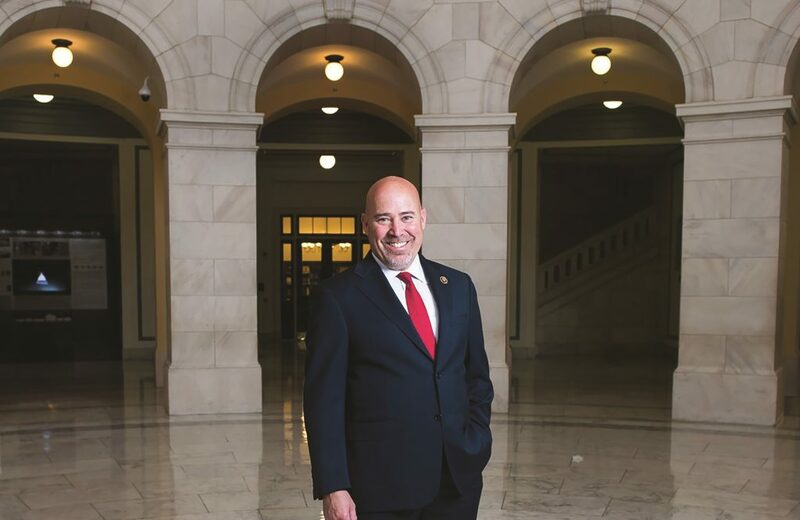 A former insurance executive who long dabbled in local politics and served for a time as mayor of the town of Randolph, Rep. MacArthur has become a key player both in advancing the priorities of the GOP caucus as well as in sponsoring a long list of bipartisan bills. Rep. Macarthur took time to discuss some of the key issues of his campaign as well as those of particular interest to the orthodox community in an interview with Hamodia at his home in Toms River. We are in an age in which politics has become increasingly vitriolic and where issues that once saw broad consensus have become increasingly partisan. You have been among the more successful legislators in reaching across the aisle. Based on your experiences, do you see a path of detoxifying the political air in Washington? I do. I think that for one, people need to be more civil just in having disagreements with each other. I was fortunate to grow up in a home where my mother was a liberal Democrat and my dad was a conservative Republican and I got to watch them and participate with them debating and arguing about ideas without being disagreeable and without accusing other people of bad motives. To me that’s the path. So I always take people who have a different idea than mine at their word and I don’t assume that they have any bad motives unless they show me otherwise. I think that’s where we need to start. Another important part has more to do with how Congress itself functions. The majority’s role is to set an agenda. That’s the privilege and the responsibility of the party that’s in the majority. The role of the minority should be to inform that agenda, to impact on it and to do what it can to get its priorities into the agenda. But that’s not the way it’s working today. The way it works today is that the majority exists to assert its will and the minority exists to become the majority. And that’s the view of a lot of members of Congress. The result is that is that the minority just becomes a resistance organization and so, I think we’ve got to get back to a better role for each of the two parties so that they can both participate in setting policy. I hold both parties responsible for this. When the Democrats were in the majority, they ramrodded a bunch of things through Congress that the American people didn’t want and now Republicans have done some things that, you know, some people don’t want. So, I think both parties have to get better at it. You took the risky move of supporting Congress’s tax overhaul in a state where a lot of people felt that capping the SALT deduction and some other elements left them on the short end of the stick. Why do you feel that the tax rewrite is ultimately beneficial for your constituents specifically? Well, first of all, the results have proven that the benefits are better for the country and for our state. Generally speaking, we’ve got a booming economy as a direct result of it. We have a booming economy with 4 percent overall growth, the lowest unemployment in 50 years, consumer confidence the highest in a decade, small-business confidence the highest ever recorded. Wages are up and unemployment claims are down, I mean this is metric after metric. Capital investment is up so it’s clearly been good for the country. It’s done well for the state of New Jersey. It is better for states who have lower taxes and it’s a sad, but true fact in New Jersey that our leaders in Trenton think they can make taxes whatever they want and it doesn’t matter if surrounding states are cheaper. Well, it does matter. People leave. Businesses leave. But nonetheless, wages are rising in New Jersey. The reason I supported the $10,000 cap was because it would have been zero if I wouldn’t have been there to negotiate something better than that and the truth is that $10,000 is for the vast majority of people in South Jersey. Eighty one percent of New Jersey residents will get a tax cut, another 10 percent will not see any change at all, and as a state we will send $9,000,000,000 less to Washington than we did last year. That’s a huge improvement. Going from $0 to $10,000 is not only worth thousands to families who itemize, but collectively it’s worth $3.4 billion a year in total. So, to me it was a no-brainer. I got involved. In my view more people in Jersey should have gotten involved and if they had, we could have made it even more than $10,000. I was the only person in the state who engaged, and that $10,000 is a big difference to people in the district. Lastly, you have to look at all the provisions of the tax bill, not just one item. Rates came down and we doubled the standard deduction, which most people take. We have a deduction of $1,300 and an additional one for seniors. We doubled the child tax credit, added a new credit for caring for an elderly parent, and lowered the corporate tax rate from 35 percent to 21 percent. We created a new special tax rate for small businesses that’s the lowest since World War II. These are all things worth supporting. So, I’m proud of the vote. One of the leading disappointments for many groups of religious traditionalists, Orthodox Jews included, is that in two years of GOP control of Congress and the White House, no action has been taken on the First Amendment Defense Act nor any other similar bill protecting religious liberty. The White House has taken some helpful actions on this front, but that can be overturned by other administrations with different ideological positions. Why has a GOP Congress failed to take the opportunity to protect religious practitioners from increasing attempts to limit their freedom to act on their beliefs in the public forum, and is there any hope of legislative action being taken in this area? I think the backdrop of everything we do in the House is a recognition of what’s going to happen to it once we get it over to the Senate. Even though the GOP controls both houses of Congress and the White House, we actually don’t control the Senate because with the small exception of certain appointments and some other items, nearly everything that goes through the Senate requires 60 votes, not 50, and we only have 51. So in the Senate, you can’t do anything without the minority’s cooperation. I think a lot of bills that might have gotten traction in the House just don’t happen because people think they are dead on arrival at the Senate. I think what we can do is improve our majorities in both chambers. The more Republicans we have the more we can do for our agenda. I can tell you that the Republican Congress is committed to religious liberty. I don’t think there is any doubt that the Republican Party is the party that is on the right side of these issues. We just need more people. Short of achieving a super majority, which is unlikely to happen in this election, what do you think can be done on the religious liberty front? I think the White House has shown a pretty keen interest in supporting individual liberties including religious liberties. I think a lot can be done with the administration. I think having enough people in the Senate to confirm jurists and Supreme Court Justices who are going to uphold religious liberties is pretty key to that. It’s a game of inches, not of massive victories. You have to win one after the other. Court precedent and Congressional action both play a role in that. Maybe we haven’t gone as far as you would like. I’m not aware that we have done anything to encroach on this liberty and it’s fair to say that we’ve sort of held the line. A top priority for the Orthodox community is school choice, which has obvious importance for a community that sends nearly 100 percent of its children to private schools. The Trump administration came in with very ambitious plans for school choice, but no major legislative action has been taken. Why do you feel this has not made it to Congress and what do you think would be appropriate ways to expand school choice in America? Most of what happens on school choice has to happen through the Department of Education. This is not just a federal issue; it’s a state issue. I can tell you unequivocally it appears that the current New Jersey governor is trying to shut down school choice pretty decisively. We can talk a long time about why I think he is doing that, but just look at his recent actions. Charter schools, other sorts of educational opportunities beside the public system are being squashed at every turn. Betsy DeVos is committed to expanding school choice and again, the Republicans in Congress are committed to trying to expand charter schools, people are trying to make sure charter schools live up to the accountabilities of Public Schools. I support that too, I think it’s reasonable. But, I think people should be able to send their children where they want and, I think we are committed to that. Again, it has to get through a 60-person vote threshold in the United States Senate. Do you think there is more that Congress can or should be doing? I would have to go back and look at the funding because that’s really where the rubber meets the road. I think the mechanisms are in place and the administration has shown a great deal of openness to education outside the public system. It’s all about budget priorities and funding. So can we do more? I have to go back and look and see where the budget has gone. I believe we have increased funding for all kinds of alternative education including vocational schools and charter schools, I think we have bumped that up each year. While not an issue you dealt with in Congress, I am sure that you are aware of the tensions that have existed between the Orthodox community and others here in Toms River. While resistance to changes in one’s neighborhood is certainly understandable to everyone, it churned up a good deal of ugliness that was then mimicked in places like Jackson and Howell. Do you think the situation has improved and do you think local officials have handled the matter appropriately? You are right. It’s not a federal issue it’s a hyper-local issue; it’s a town issue. As I shared with the group I met with yesterday [a reference to a meeting with Jewish community activists], I think that the first words out of my mouth were, “As a Toms River resident, welcome.” This is a 100,000-person town, there is plenty of room for all of us. To have a diverse community is important. What little I have had in terms of interaction, I think public officials are trying and I think there has been good dialogue. I heard great things around that table yesterday about different groups that are reaching out. That’s the best way to settle this down, when you break down barriers to communication and people realize, hey, these are just people who want to live in this town, people who are working and running businesses and raising families and doing the things that we all do. The people who run the blogs usually don’t come to those meetings. Trust me, the people who insult me on the blogs and such don’t come for dialogue either. At the meeting yesterday, I mentioned that there is growing bias and I know you can’t control all of it, but elected leaders need to be out front and need to be a moral voice and a moral example. I have tried to be that and will continue to do so. There was a synagogue based in Burlington County that was defaced a few months ago and I publicly got out in front of it and said there is no place for hate in our society and if you encounter that, let me know, because I will get out in front of it. There is no place for it here. You have consistently supported sanctions and other robust approaches to prevent Iran from becoming a nuclear power. The Iranian government has taken an increasingly hard line and it does not seem likely that any of these strategies will change their course. What positive effects do you think sanctions and other similar actions could have on the situation? First, rewind. The regime there has never been open to changing its course. That’s why the Iran deal was misguided in the first place. The Iran deal was born out of weakness in the prior administration, the president and secretary of state wanted to deal at any cost. They ended up building a framework where Iran would still get nuclear weapons at a certain date in the future and time goes by fast, we are getting closer and closer to that end date. Besides for that, it gave Iran an unfettered ability to build up ballistic missiles and traditional military capabilities and it gave them piles of cash to foment unrest that they do in over 30 countries. They are the leading state sponsor of terrorism. It was a terrible deal from the get-go and it was also a dishonest deal. When President Obama couldn’t get it all done legally, he strapped bundles of foreign currency onto pallets and shipped them to people in Iran. It was basically a buy-off. It would have been against the law if it would be U.S. currency so he did the exchange with foreign currency. It was deceptive and certainly broke the spirit of the law. The deal has been broken since the day it started. In my view, Iran habroken the spirit of the deal constantly and I think they violated the letter of it pretty repeatedly as well. So I have always been opposed to it and I think the president was right in not recertifying it. It wasn’t based on our actions that he didn’t recertify, it was based on Iran’s actions. Secondly, Josh Gottheimer, who is a Democrat representative in Northern New Jersey, and I went to the president before he announced his decision and we asked him: Whatever the administration does on recertification, you have got to sanction Iran on ballistic missile proliferation. The only reason ballistic missiles are created by any society is to deliver weapons of mass destruction, so there is no legitimate reason for Iran to have them. So we asked the president to clamp down on them and sanction them. To answer your question, do sanctions work? They do work. Let’s remember that the size of Iran’s economy is comparable to that of the state of Maryland. This is not a world power. This is a dangerous power, but they never should have been treated like some equal world power that we were desperate to get a deal done with. The current president recognizes that Iran is a bit player trying to be dominant in the region. Bit player is an exaggeration, but you know what I’m saying. They are not a global super power. Iran is not an economic super power and that means sanctions can begin to squeeze them. I think there is a big difference in the will of the Iranian leaders and the will of the Iranian people, so the more we squeeze the Iranian leaders, the more they are subject to the pressure of their people who they are oppressing. So I think sanctions are important and should be used. Any closing messages for our readers? I want your community to know that I am a strong supporter of Israel and U.S.-Israel relations. I know your community has serious concerns on these issues and I don’t know a stronger supporter of U.S.-Israel relations than me. I have vocally and stridently opposed the Iran Deal, I think the BDS movement is misguided. My opponent has been propped up by J-Street. He has raised a lot of money through them and he is on the wrong side of these issues. And I have been crystal clear, not only with my voting, but with my words, that our aid to the Palestinians should be linked to their not using the aid to foment violence. They should not be using American taxpayer money to go after our main ally in the region. That’s not right; there should be accountability, and I voted for that. An amendment I sponsored two years ago had a provision that made it into the defense bill that authorized a $25 million deal between the Department of Defense and Israel on the development of directed-energy technology. The goal is that instead of using Iron Dome, which is basically shooting a bullet with a bullet, or in this case, knocking down a missile with another missile, the defense system would use beams of directed energy to destroy rockets. It’s a much cheaper and more accurate way to take out incoming fire.